The U.S. Commerce Department’s United States Patent & Trademark Office (USPTO) today announced that Patents for Humanity is being renewed as an annual program. Started as a one-year pilot in 2012, the program recognizes businesses, inventors, non-profits, and universities who leverage their intellectual property portfolio to tackle global humanitarian challenges. 2013 Patents for Humanity pilot award winners pioneered innovative business models in frontier markets to deliver much-needed HIV medicine, create more nutritious food products for the poor, and deliver solar energy to off-grid villages, among others. Building on the success of the pilot, USPTO will institute an annual competition to reward entrepreneurs and innovators who deploy patented technologies to address global challenges in five categories that reflect the President's development agenda: medicine, nutrition, sanitation, household energy, and living standards. The USPTO expects to select about 10 winners this year who will receive public recognition and an acceleration certificate to expedite select proceedings at the USPTO. Honorable mentions will also be awarded with a more limited certificate to accelerate a patent application of the recipient's choosing. 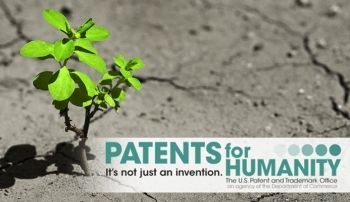 USPTO launched Patents for Humanity in February 2012 as part of an Obama administration initiative encouraging game-changing innovations to solve long-standing development challenges. In January 2013, Patents for Humanity received an award for Best National IP and Technology Transfer Policy of 2012 from Licensing Executives Society International (LESI), a leading non-profit that supports IP professionals. For details on how to apply for a 2014 award, view the Federal Register notice or learn more about the Patents for Humanity program.